"Our home is just under the North Star", - evenks say. Evenkian folklore is rich and peculiar. Their tales, legends and traditions are true dimonds of folklore poerty... Would you like to find out why the crucian turned flat, and the Bear doesn't have a thumb? Why is the Raven black rather than white? Or what price is a little needle for an evenk? You will reveal all that out having read the evenk tales. 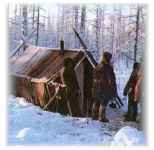 Evenks' traditional activities are peltry trading, deer breeding and fishery... Deer breeding was always considered one of the major occupations of the aboriginal population of the North. Deer are both food and clothes for evenks, their beloved means of transportation. A lot has changed ever since but the meaning of deer breeding stays the same valuable and precious, still the herds of northern deer pasture in tundra. And though mononarts, airplanes and helicopters rapidly penetrate our being, deer remain the first friend. The most remarkable and colourful impressions with Evenkia is meeting people. Qualities like open heartedness and unfakable participation are not only hard to run without but actually indispensable round these places. And regardless who you are, you will get a place by a fire to get warm, some food to assuage the hunger, all that requesting nothing in return. That's the tradition. The folk memories keep track of numerous mysteries and riddles of Evenkiya , one of them being the voodooing. What is it - an art or a quackery?.. And only the repertoire of a folk ensemble or a folk writer's can introduce you the ritual ceremonial of evenks.